Unifor President Jerry Dias plans to meet with UAW leaders in Detroit on Thursday as both unions ramp up their campaigns to save five General Motors plants in Canada and the United States. Dias, speaking with Automotive News Canada on Wednesday, said the meeting is scheduled for Thursday morning. A UAW spokesman confirmed a meeting was scheduled but said he did not know who from the American union would meet with Dias. GM’s plans to potentially close up to four U.S. plants and shutter Oshawa Assembly in Ontario by the end of the year will be the focus of the meeting, Dias said. GM’s plans are part of a larger corporate restructuring and have drawn the ire of both unions, which accuse the automaker of abandoning Canadian and American workers for lower wages in Mexico. Ironically, GM reported its fourth-quarter and 2018 profits on Wednesday — with a robust North American profit of $10.8 billion that translates into average UAW profit-sharing checks of $10,750 per workers, about $1,000 less on average than 2017’s payouts. Dias on Wednesday said Unifor remains uninterested in adopting profit-sharing in Canada, saying the union prefers higher guaranteed wages. The union aired the ad even after it received a letter from GM Canada’s lawyers demanding it not broadcast the commercial, which it called “knowingly false and misleading.” The company threatened legal action if it aired. Unifor also plans on airing commercials during high-profile Canadian broadcasts of the Academy Awards, Grammy Awards and NHL games. 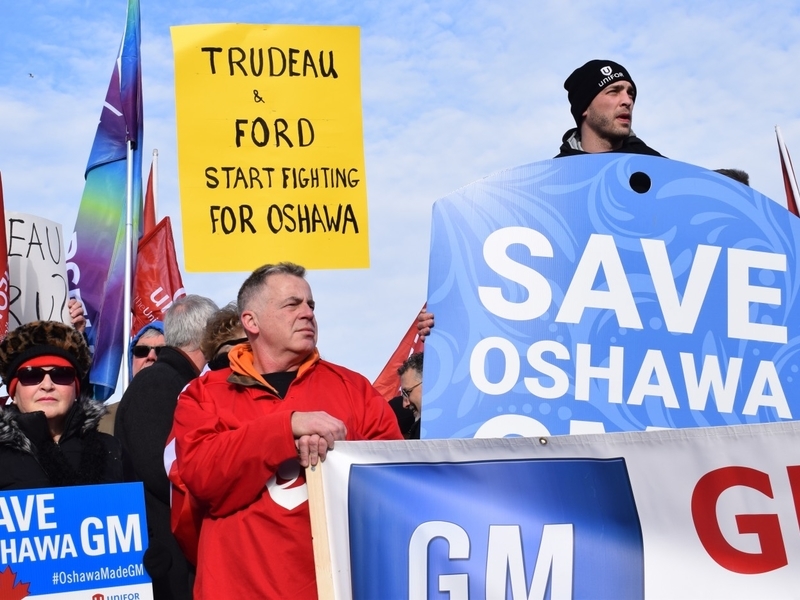 Unifor in recent weeks also called for a boycott of all GM vehicles assembled in Mexico and staged various protests, including a two-day blockade of GM Canada’s headquarters in Oshawa. GM Canada said the Mexico boycott would hurt Canadian and American suppliers to those plants and said the blockade had no effect on its operations. The UAW stepped up its efforts by releasing videos on social media in January that call GM’s plans greedy and unnecessary. The union also urged members to not buy the new Chevrolet Blazer midsize crossover, which is built in Mexico. The UAW and GM are set to negotiate a new contract for American workers later this year. The fates of Lordstown Assembly in Ohio and Hamtramck Assembly in Michigan, as well as powertrain plants in Warren, Mich., and Baltimore, are likely to be the focus of the talks. None of the four plants has product allocated for it beyond 2019. Unifor will negotiate with GM in 2020, months after the automaker plans on ending production at Oshawa Assembly. Dias is demanding GM honor the current contract and keep production going at Oshawa until the agreement expires in September 2020.